Healthy breakfast is the current theme in my group - Healthy Recipes by Homemakers. So we are all coming up with ideas to cook healthy meals for our families, starting with health-friendly breakfast ideas. Yesterday, I had decided to make kitchudi (a mixed lentil and rice porridge) and soaked moong dal, masoor dal and rice together for lunch. But then when it was time to prepare lunch, I changed my mind and decided to experiment with lentils and rice. I let it remain soaked until evening. In the evening, I ground everything together and kept the batter covered overnight. Let's see what I was able to cook with the batter. Soak dals and rice together for 5-7 hours. I had actually soaked for kitchudi. 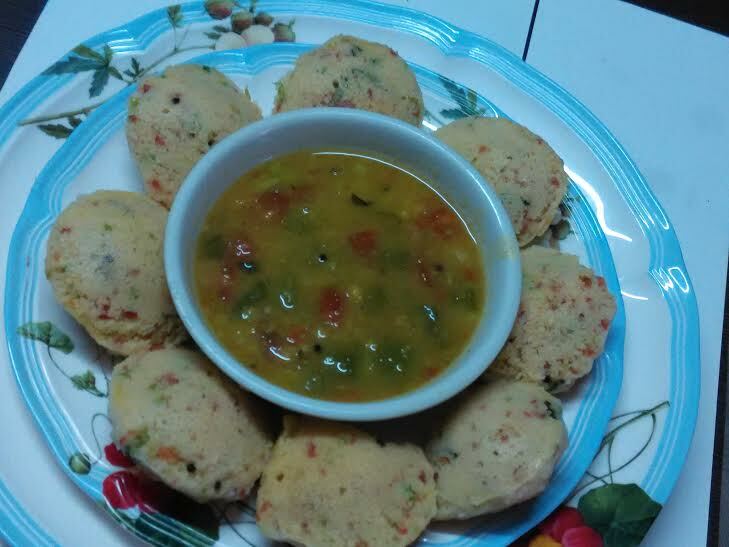 But ended up making idli. Grind without or little water and keep the batter covered overnight. Take a pan, add oil. Throw in hing, mustard seeds, chana dal, and urad dal and curry leaves. Pour this tadka over the batter and add salt. Next add all chopped veggies and ginger and mix the batter well. Take a cooker. Add 1/2 cup water. 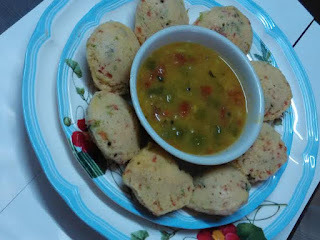 Grease the idli stand and steam idlis for 7-8 minutes or longer. Enjoy with coconut chutney, Bengal gram chutney, coriander chutney, or sambar. I relished this healthy breakfast with coriander chutney. If you want to try oats-suji idli, click here.